On Saturday, we had our 2nd field trip for Basic Rock Climbing school. 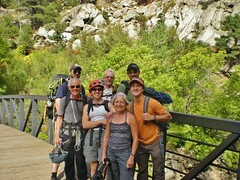 Kent took us to Dome Rock, where we took the students up their first “multi-pitch” climb. 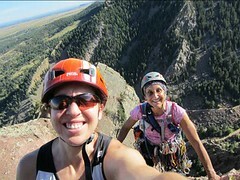 Lauren and I climbed the classic route, Rewritten, on Friday. It was a toasty day on the rock, but we still had a fabulous time. I led the easy pitches and Lauren battled with the harder ones. 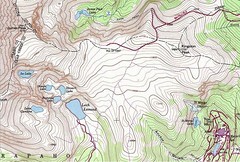 We had a very pleasant hike back down to the packs; no problems with routefinding. 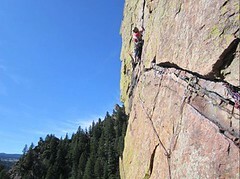 (Sometimes, in Eldo, the crux is in the descent). Pictures are courtesy of Lauren. Unfortunately, I don’t have higher resolution images…sorry! 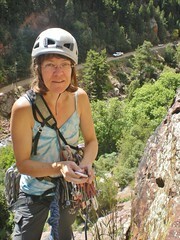 On September 17, I spent the day volunteering as an assistant instructor for the CMC Boulder’s Basic Rock School. Students Walt, Ian, Max, Derek, Chris, and Erin were eager to be belaying, rapelling, and climbing during this first (of four) field trips. I was excited to be working with Kent, the lead instructor, and Michael, another assistant. There was a lot of material to cover, but Kent did a real whiz-bang job! 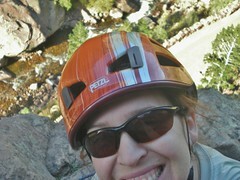 You are currently browsing the climbergirl blog blog archives for September, 2011.